Bucharest Stock Exchange (BVB) managed to stay in the positive zone at the end of the first eight months despite external turmoil, which sent several markets in negative territory amid growing international uncertainty. Global indices provider Morgan Stanley Capital International (MSCI) reveal world markets plummeted abruptly from the beginning of this year. MSCI indices fell sharply, in USD-equivalent, as Emerging Markets went down by 8 percent and Frontier Markets by 15 percent at the end of the first eight months. By contrast, in the same period, BET – the main index of the Bucharest Stock Exchange – is up by 4.4 percent in USD-equivalent, while BET-TR – the index including also the dividends – gain up to 13 percent USD-equivalent. 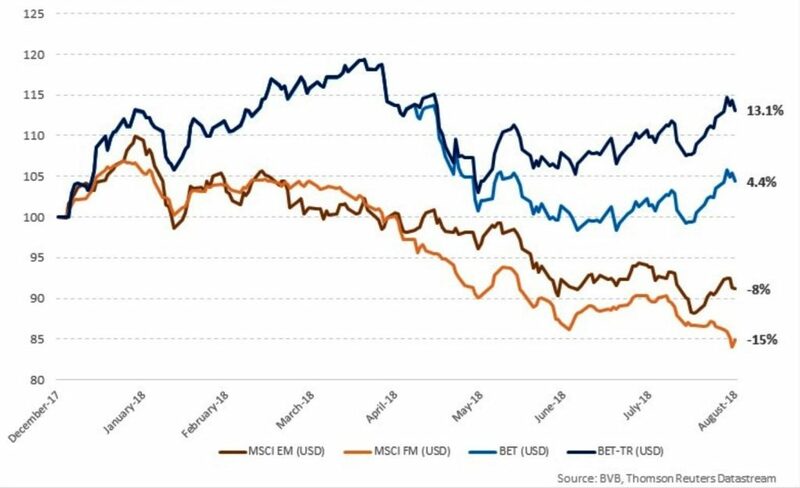 The Romanian capital market (indices BET and BET-TR) outperforms MSCI indices for Emerging Markets (EM) and Fronties Markets (FM) in the first 8 months. “We pay attention to external developments because markets are highly interconnected today. Even in an international environment experiencing volatility and turbulences, Romania is still able to deliver positive returns to investors. That is why we want to diversify and develop the local market by offering new opportunities and trading instruments so that the investment activity becomes more effervescent. The local capital market has the potential to greatly increase liquidity, and this could also translate into a presumably better evaluation of listed Romanian companies,” said Adrian Tanase, CEO of BVB. “The upward trend of the Romanian stock market can be explained by the performance most issuers had reported. The results reside in the positive evolution of the companies listed on the BVB, as they managed to benefit from the strong growth of the economy and registered half-year operational results generally superior to those from last year, while also giving consistent dividends,” stated Lucian Anghel, president of the Board of Governors of BVB. Looking back in the last 12 months, we have some surprising winners in the Top 10. Dafora (DAFR) is in the lead with 111.2 percent gain, followed by Transilvania Costructii (COTR) with 86.7 percent and Carbochim (CBC) with 62.5 percent. Alro Slatina (ALR) is next, with an increase of the price of 55.8 percent, followed by Zentiva (SCD) with 42.6 percent. Farmaceutica Remedia (RMAH) is on the 6th place with a gain of 41.9 percent, followed by UAMT (UAM) with 38.7 percent and TMK – Artrom (ART) with 23 percent. Romcarbon (ROCE) is next with 21.4 percent and the top is closed by Turism Felix (TUFE) with 19.1 percent. But if an investor would choose the wrong side it would have lost most of the money. The biggest “looser” on the market is Petrolexportimpost (PEI) which registered a fall of 71.1 percent, followed by Electroputere (EPT) with a minus of 65.7 percent and Cemacon (CEON) with -51.02 percent. Prefab (PREH) is next with a minus of 28.8 percent and on the fifth place is Med Life (M) with a fall of 28.7 percent. The post Bucharest Stock exchange managed to stay in the positive territory after 8 months appeared first on Business Review.